The famous artist of the end of the 19th century, I. Kramsky, painted many beautiful paintings that have already become masterpieces of romanticism, and among them are many paintings depicting the nighttime in all its colors and colors. But the best picture of all before that he created, in the general opinion of critics and lovers of creativity Kramskogo was the picture “Moonlight Night”, written in 1880. The artist tried to convey to the canvas all the beauty of the summer night, when everything is immersed in the mysterious darkness through which only a thin ray of the moon can penetrate. 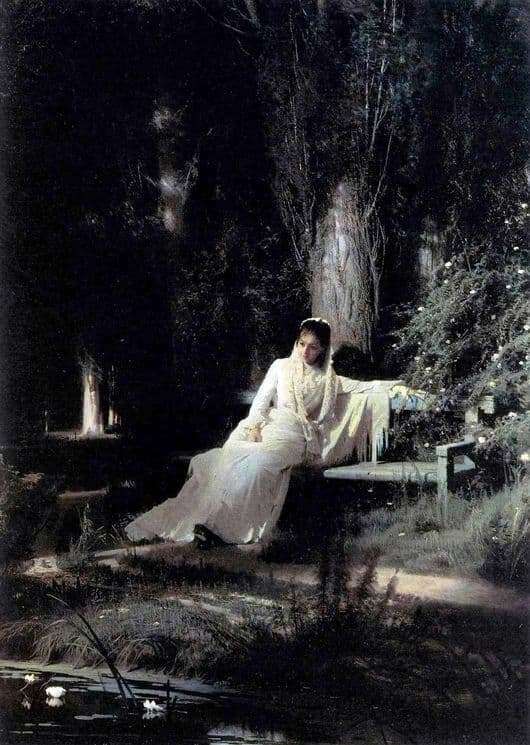 The close-up picture shows a woman in a white dress who leaned in thought over the bench on which she was sitting. At her feet is her pond, reflecting the glare of the moon, and behind her back poplars, their peaks, stretching far beyond the frame of the picture, as if inviting the viewer to follow them, waiting for its continuation. The woman silently looks at the surface of the water, she is sad, and strive for solitude, because even the breeze does not dare to disturb the moonlit park. The artist was able to very accurately and accurately convey all the naturalness of the surrounding nature, with the help of highlights of the moon, illuminating the sandy path and the reeds dormant in the water. Despite the fact that the picture depicts a summer night and the moon barely makes its way through the trees, the background of the picture is also ideal for the viewer quite well, as it depicts an alley, and all the same poplars where moon glares try to break through the glades at their top. The tranquility and serenity of the night, the pensiveness of a woman by the pond, and the perseverance of the moon sorceress seeking to light every dark corner – the artist conveyed all this with great skill and skill, for which he was rewarded by grateful descendants who highly appreciated his work. Praised, in his memoirs, as a great Russian artist, putting on a par with Levitan and Bryulov.